Sipokazi Luzipo is very charismatic, but even more so, audiences around the world seem to be uplifted by the music coming from the two-time Grammy Award-winning group Soweto Gospel Choir, of which she is a founding member. Still in her early 20s, Sipokazi auditioned for the South African TV talent show Popstars and attended the musical workshop ‘Siya Phezulu’. She has won many school and church choir competitions, and her determination to be a professional singer is only matched by her passion for education and her belief. She plans to go to university to study for a degree in commerce, so can support herself while she pursues her dream of being a professional singer. Gospel and traditional music are the genres she enjoys most. She is a devoted Christian who believes her God-given talent will take her far in life. Soweto Gospel Choir is currently on a UK-wide tour and the choristers are delighting their audiences with some old favourites - such as This Little Light Of Mine and Mbube (The Lion Sleeps Tonight) - and a number of new songs, including their own version of the Andrea Crouch classic Oh! It’s Jesus. There are also several tracks from their new album Grace which will be released in June this year. Formed in November 2002, by promoters/presenters Andrew Kay, David Vigo and Clifford Hocking, in association with Beverly Bryer and David Mulovhedzi, the choir quickly became an instant, multi award-winning sensation across the world. Their <?xml:namespace prefix = st1 ns = "urn:schemas-microsoft-com:office:smarttags" />UK premiere was at the Edinburgh Festival in 2003. 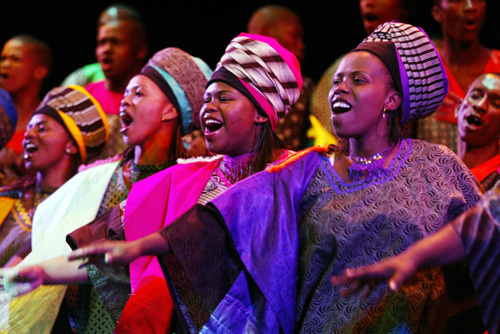 With a repertoire of world, gospel and spiritual classics, sung in English, Zulu, Xhosa, Venda, Afrikaans and Sotho, the 24 inspirational singers, drummers and dancers deliver an uplifting and moving show at this year’s Edinburgh Festival, which effortlessly shifts gear between driving drums and dances, to the sublime beauty of African acapella harmonies. Your group epitomizes the formidable power of African gospel music, what actually makes African Christian music so magnetic to audiences across the world? It must be the experiences that we've gone through as African people that make us feel that the only place we can run to is God and so when singing, the music comes from the deepest part of our hearts, embraced by the feeling of safety in God and a deep appreciation for his sincere love. Can you please tell us the history of gospel music in South Africa and which part of this history has been a source of inspiration to your group? Church is the place where South Africans ran to in the apartheid era so that is where gospel was created for us. It was the only voice we had as African people and we felt God was our only source of survival , so the very appreciation we had then as Africans is the same appreciation we have as a group of performers and we are thankful for the opportunity we have to share our music. It's almost seven years since the choir began, what have been the highlight and the low point of your many experiences so far? It has to be the achievements we've made, travelling the world and having thousands of fans. Our Grammy's, our association with Peter Gabriel, Queen, Nelson Mandela and other icons. Being the first SA group to perform at the Oscars. I think that the low point for many of the choir would be travelling for long periods and missing our loved ones. Everything else is more than what we ever dreamed it would be. You have over 50 members, how do manage such large group? We are divided into two groups so we share the load. We've been together for such a long time that we now feel and behave like a family. We know each other extremely well. You are becoming well known in the UK, what has been the reception so far on your current tour of the country? Wonderful, although different countries express themselves in different ways. At the end of each concert they are singing, dancing or crying! They seem to love us. You have your own charity, which you've been funding, can you please tell us the inspiration behind Nkosi's Haven Vukani? We're so blessed that we felt a need to share that blessing with the little AIDS orphans in our country that have nothing. We buy them groceries, clothes, blankets, appliances etc. We can help when they can't help themselves. It is wonderful that our fame can benefit the AIDS orphans organisations in our country which receive little or no government funding. How can readers donate to this foundation? We collect donations after each of our concerts, and also people who can't attend our shows and want to donate can visit www.sowetogospelchoir.com where they will find all the information and links for the charity. What does the future hold for your group? I mean what can your fans in the UK and around the world look forward to in the months and years ahead? We've just released our new album "Grace" which is fantastic and hopefully another Grammy nomination will come with it. We finish at the Edinburgh Festival at the end of August and tour the UK 3 September - 10 October. Then there is more touring of the world. Changing and inspiring people's lives through our music. Our fans mean so much to us and we hope they enjoy the journey with us. Soweto Gospel Choir tours the UK this autumn with their new concert show, Soweto Gospel Choir In Concert, which opens at the Edinburgh Festival in August (6 – 31) and subsequently visits 27 towns across the UK (3 September – 10 October).